Islamabad: An exhibition of weaving titled “Tana Bana - Weavers of the Human Soul” featuring the country’s master artisans from remote regions of Pakistan and their works concluded on Sunday. The nine-day exhibition, organised by National Institute of Folk and Traditional Heritage (Lok Virsa), was aimed at displaying the traditional skills of weaving to the capital city’s discerning visitors and to make them aware how traditional and modern weaving skills could be combined to create hybrid novelties of pattern and designs. The exhibition provided an opportunity to people of twin cities to shop at reasonable prices directly from the artisans. It also provided a market to the traditional weavers and the clients and patrons of traditional crafts without the middleman’s cut. These master weavers, along with their 32 handlooms (Khuddis) exhibited the traditional art of weaving to visitors. Beautifully designed fabrics, traditional clothing and articles of clothing produced by these master weavers were also exhibited. Students from Karachi School of Arts, who have recently done their masters in textile, also participated in the exhibition with their khuddis. From fabrics of all kinds to carpets, rugs and curtains the weavers in all towns of the country are producing the typical product of their age old tradition in the shape of khes, daries, lungis, khaddar, banarsi silk, cotton and woven cloth of all descriptions, stylish floor rugs and carpets. Old methods of production following ancient traditions passed on from generation to generation are still alive in the work and skills of the handloom craftsmen. According to historical research, the world’s earliest known woven cotton cloth was found at the 5,000 years old Moenjodaro site in Sindh, where cotton cultivation is still a major farming practice. Evidence of cotton cultivation, sheep breeding, spindles and other tools indicate that cotton and wool were spun and woven not only in Moenjodaro but also in Harappa, another ancient site. The export of cotton cloth to Mesopotamia shows that cloth making was a thriving industry as far back as pre-Vedic times. Hand woven fabrics became the leading industry and export item in the Mughal period. The craft suffered immensely during the British rule, as the colonials wanted their machine made textiles to replace the indigenous handloom product. Talking to Daily Times, Mazharul Islam, Executive Director Lok Virsa, who is also an internationally known writer and folklorist, said Lok Virsa intended to create a combination between traditional and modern weaving. Lok Virsa also wants to encourage artisans to produce handicrafts using traditional skills, patterns and themes in an innovative way to ensure continuity and sustainability of these traditional skills, he added. Islam said weaving was not only a craft but a mystic tradition associated with Sufis, who used weaving as a meditational practice as it involved transferring cotton and wool into cloth that provided comfort and cover to mankind against heat and cold. Chennai: “Ella pugazhum iraivanuke” (All glory is to God) — the Tamil lines in Rahman’s acceptance speech capture the essence of his approach to work. Spirituality is the cornerstone of the maestro’s life and music, the influence that defines him. Friends and colleagues consider Rahman a Sufi in the truest sense of the word — a man who subsumes his ego, whose humility and kindness shows in every action and word. He is gentle in his interactions, self-effacing in temperament — even newcomers do not find him intimidating despite his formidable reputation. When they were recording with children for a song in ‘Bombay’, for instance, Rahman conducted the kids himself as he thought they would be more comfortable with him, says S Sivakumar, chief sound engineer, A M Studio. Rahman is often seen lightly mocking himself when he slips during rehearsals; it’s an attitude that’s known to put everyone in the studio at ease. “His spirituality makes him sensitive to signs around him,” says lyricist Prasoon Joshi. A Hindu who converted to Islam after his family went through trying times, Rahman’s music is inspired by a mysticism which stresses on the universality of love. The Sufi in the man is evident in songs such as ‘Chhaiya, Chhaiya’ and ‘Piya Haji Ali’. Though he does cater to demanding producers and nod at prevailing trends in the film industry, he is in his element when asked to capture the syncretism and exuberance of spiritual bliss. The 2008 hit ‘Khwaja Mere Khwaja’ from ‘Jodha Akbar’ is among the most memorable examples in recent years. [Visit the Artist's website http://www.arrahman.com/v2/; Picture from KM Music Conservatory http://www.kmmc.in/html/home.php]. Islamabad: The Markazi Imam Husssain Council will organise a conference in connection with the Martyrdom of Hazrat Imam Hassan (AS) today (Monday). According to a press release issued here on Sunday, prominent Ulema, Mashaikhs and scholars from all schools of thought will participate and highlight the services and efforts of the Imam for the projection and promotion of Islam. Chairman Markazi Imam Hussain Council Dr Ghazanfar Mehdi said that such conferences and seminars would also be held in Karachi, Quetta, Lahore, Peshawar, Gilgit, Muzaffarabad, Skardu and Parachinar on the day. Islamabad: Sufism and science take human beings on equal footing and whatever they do is for whole the humanity, said Ijaz Shahid, an analyst. He was speaking in a talk on ‘Sufism and science’, organised by Islamabad Cultural Forum at TVO House, here Friday. Dr Noor Fatima conducted the proceedings. Shahid said that Sufis for many are special people related with religious ideas but Sufism also offers solutions to political problems of countries and societies. He said that Sufism dates back to ancient times of human history and is a continuation of mysticism. He said that different orders of Sufis started emerging in the Islamic world a century after the death of Prophet Muhammad (PBUH). He said that Sufis believe in integrating with the ultimate reality in the end which they call oneness with God and they try to achieve this with practice. Ijaz Shahid mentioned orders of Qadria, Chishtia, Suharwardya, Hallajia, Rumi, Ghazali and Farabi. He said that Hallaj achieved total annihilation of self into God. He was humiliated, meddled into garbage, executed and burnt. He said that some Sufis discarded rituals and prayers being superficial. He said that some Sufis perceive to have gone beyond time and space and claim certain powers. He said that Lord Buddha abandoned luxuries to find salvation through meditation in woods. Finally he found the answers to ‘dukhas’ (sufferings) of man and we can overcome it with humiliation and self-denial. He said that even Buddhism has so many denominations. He said that ‘budhi’, ‘dharma’ and ‘sangha’ are stages of Buddhism. He said that Sufis wanted integration, ‘irfan’ (fana). He said that philosophies of Christianity, Hinduism and Jainism also had such stages or ‘muqamat’ of mysticism. He said that science is based on facts. He said that both Sufism and science take human beings on equal footing and whatever they do is for whole the humanity. He said that there is a Sufi in all of us at one stage of our lives. He said even non-believers artists and men of letters experience mystic feelings. He said that some people are timely Sufis and feel satisfied in the company of mystics which he called an escape route for them.He said that there could be non-Sufis (quack Sufis) acting as Sufis for the sake of livelihood. He said that feeling like Sufis is a bio-psychological phenomenon. He said that it is a brain function to have feelings and as we have different brains so express different reactions to same reality like thumb impressions. He said that DNA affects neurons which have impact on our personality and a change in it changes one’s behaviour. In the question hour, Professor Ashfaq Salim Mirza said that except biological state of mind, the topic had not been touched properly by the speaker. He said that Lord Buddha had nothing to do with mysticism. He said that Farabi was a scientist and Ghazali was a predecessor of today’s fundamentalists. He said that intuitionism is the core of Sufism. A participant said that mysticism is an offshoot of religion closest to science. He said that in mysticism, we all are parts (juzv) of a whole (kull) and in science whatever exists is made of 92 elements (matter). He said that mystic poetry of Ghalib, Mir etc fits into scientific interpretation. [Picture: Faisal Mosque, Islamabad. Photo from http://en.wikipedia.org/wiki/Faisal_Mosque]. Islamabad: An exquisite exhibition of paintings and sketches titled ‘Rural Pakistan and Reflections’ by Badar Moinuddin started at Nomad Gallery, Saidpur Village, on Saturday. Badar Moinuddin is an artist, painter, calligraphist, and a former lecturer at Aitchison College Lahore. His romance with art dates back to 1960’s. Moinuddin’s cache of 29 paintings and sketches has created a new style of art depicting the rural life, especially of a child and mother, and artisans like of barber, potter, carpenter and devotees participating in ‘Urs’, which he calls the deprived classes of Pakistan. He has a burning desire, and a longing for a chance to show misery and pain of rural life. “How they are victimised and suffer extreme deprivation and how they spend their lives,” he told Daily Times. Moin wants to show how lives of ‘malangs (devotees)’, villagers and people of rural areas are deprived of even small happiness. In paintings, he has tried to capture all human feelings that are hurt and killed in survival for the fittest. In one of his painting titled ‘hair care’, a mother is picking lice out of her daughter’s matted hair. A painting is titled ‘devotees 1 & 2’ showing malangs preparing hemp juice under a shady tree. Moin enjoys playing with reflections in door mirrors and in car windscreens. He said, having been born to a feudal and religious family in Pakpattan, his early sights and sounds evolved around the shrine of the great Sufi Saint Baba Farid Ganjshakar. “The presence of Sufis, mystics, dervishes, qawwaals, malangs and crowds of people were a common sight in my growing up years. The ‘lagarkhana’ where charity food was distributed daily was frequented by a lot of villagers,” he said. Moin, an economist by education and an architect by profession, said rituals of ‘sama’ and ‘qawwali’ were regularly attended to and the sight of Sufis getting into a ‘trance’ was a frightening experience at first but became a routine as time went by. “Today these images are part of my life experiences and painting all of them comes naturally to me,” he said. Talking about ‘reflection series’, Moin said this series was basically realism in its abstract form - one may call it ‘abstract realism’. “In any indoor or outdoor situation, light reflecting on glossy surfaces creates abstract images, which can be seen as one moves about,” Moin said. [Picture: Potter; Oil on Canvas. Photo from the Artist website: http://www.badarmoin.com/]. Coleman Barks doesn't so much translate Jelaluddin Rumi as speak for him. The 13th-century theologian and poet left behind a vast body of lyric poetry, metaphysical writings, lectures and letters that have influenced Persian, Urdu and Turkish literature for centuries. He also inspired the whirling dervishes, who base their practices on Rumi, including the dancing meditation that Rumi originated. One of the most widely read of Rumi's translators, Barks must be celebrated not merely as the man who rendered Rumi viable in a new age but as a poet himself. He brings his own sense of rhythm and language to the work. Barks has more than 15 volumes of translations in print, which have helped make Rumi (and Barks) one of the most popular and best-selling poets in the country. Barks said his greatest inspiration occurred on May 2, 1977, when a Sufi holy man appeared in his dream sitting inside a ball of light. "He just raised his head with his eyes closed and his head bowed, and he said, 'I love you.' And I said, 'I love you, too.'" Later, Barks said, he was introduced to this Sufi master in real life and spent many hours learning from him. "I can't prove it happened but it did," he said. "He would come to me in dreams. I have a rich dream life anyway. People come to me a good deal. It's some kind of visit. I'm a real strict doubter. I religiously keep a dream notebook and compare images that occur in real life and see if they can concur. It's my own experiment. I'm interested in that dimension of awareness." 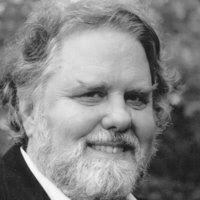 His fascination with Rumi and the beginning of his second career began in 1976 when fellow poet Robert Bly gave Barks a volume of formal poetry translated from the original Persian by A. J. Arberry. Bly told him the poems "need to be released from their cages." "I took it out of translationese and made it into free-verse poetry in the tradition of William Carlos Williams and Walt Whitman," he said. "Rumi fits well into that tradition. My work is to translate the translations from Persian or Farsii. "Robert Bly has a theory that the Council of Nicea 326, which expunged the ecstatic material (scenes of Jesus dancing) from the New Testament, created a longing for poetry that comes out of the ecstatic. We had Whitman and to some degree Emily Dickinson, but I think the loss is being filled now by Rumi's poetry and that we have, for a long time, wanted someone with an ecstatic vision, a mature human being." Barks feels that translating Rumi has loosened him up. "He's made my imagination more incandescent, more eager to make leaps," he said. "He's such a master. It's like an apprenticeship. I work on some aspect of Rumi every day." But can he ever translate everything ever written by the prolific Rumi? Barks said there is too much material to make that possible. He mentioned the six books and some 64,000 lines of the "Masnavi," considered Rumi's greatest poetic work, composed during the last years of his life. Rumi had a team of scribes who followed him around, scribbling down everything he said. Barks said Rumi would revise the copies later. "It was a spontaneous poetry fountain," he said. "We just don't know how he did this. But I don't think it's possible to write Shakespeare's plays either. They seemed to have lived at a higher pitch than us. They never looked back. They were people who had jobs and were married. They're not renunciates. They're trying to transform life." Picture: Professor Coleman Barks. Photo: The Mountain Express. 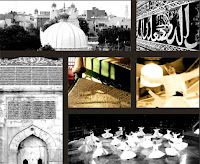 Ajmer: To spread the message of harmony and brotherhood, a Sufi festival is being organized for the first time at the dargah of Khwaja Moinuddin Chishti in Ajmer from February 24. The festival will have more that 400 participants showcasing their painting and calligraphy skills based on Islam. The theme would highlight moderate Islam that does not discriminate one person from another. Briefing the media about the purpose of the festival, Dr Janmadulla Hussein Chishti, convenor of the festival, said: "It is a dying art. Through calligraphy, painters want to describe Sufism. The art will show how one can love the Almighty." 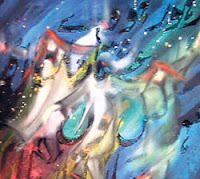 He added, "Sufi paintings show how a devotee can go into a trance leaving everything behind. It gives out the message of love." Talking about the venue of the festival, Janmadulla said: "The festival would be organized in mehfil khana of dargah and it would remain open till March 4." He said that this is the first time in the country when a festival on Sufi art has been organized. "Since Khwaja Moinuddin Chishti was one of the greatest Sufi followers in the country, we are trying to give the message of love to all the people from here," said Janmadulla. Meanwhile, Salman Chishti, who took the initiative to re-establish Sufi art in the country said, "Traces of Sufi art are found mostly in Turkey and I am recollecting calligraphy on Sufism. About 400 paintings have been invited in this exhibition." He said, "The love of the Almighty gives significance to harmony that is above all class, creed and colour. It is an initiation to support moderate Islam throughout the world," said Salman. "This art form, which was in full swing during the period of Omar Khayyam, when the love of the Almighty was shown with a glass and a jug of wine or a woman and man, is slowly dying. It was a way of showing that the Almighty pours out His love for devotees just like wine is poured out of the jug. Real Sufism went with Khwaja Moinuddin Chishti who came to India from Turkey." To spread the message of Sufi art, a delegation from Turkey will also arrive here. "We have also invited Sufi painter Jama Anand from Gujarat. A delegation of the Ashki Jerrahi Order reached Ajmer on Sunday to see the preparation of the Sufi festival. We are also running this organization in America to spread Sufism," said Nabeel Sarwar, a member of the Jerrahi Order. [Picture: Salman Chishty Phtography. Photo from http://www.chishtyfoundation.org/sufiart.htm]. A major event occurred on December 29, in Bangladesh, the third largest Muslim state in the world with a population of 150 million: Over 86% of 80 million eligible voters elected the Awami League led by Sheikh Hasina to power, ending two years of a military-backed emergency rule. In many senses, it was a watershed election in a developing country, but was largely ignored by the international press because there was no "breaking story" of violence here. Bangladesh is known for its poverty and frequent natural disasters that visit the country on a regular basis. It is hardly given the credit for the spirit of its people for fighting to overcome poverty and natural disasters. In 1988, when Bangladesh faced one of the worst floods ever known in human history, foreign aid workers and journalists were astounded by the resilience of the Bangladeshi people. A lot of this resilience and fighting spirit is derived from their faith in Islam as a "complete code of life" for 88% of Bangladeshis. There were speculations abroad that democracy would not return; that there would by violence and disorder in Bangladesh during the period of the military-backed rule since January 11, 2007. Before the emergency, Bangladesh had an unfortunate tryst with widespread violence and corruption where the two main parties, the Bangladesh Nationalist Party (BNP), the party in power before the military backed government, and the Awami League (AL), contributed to bringing Bangladesh close to a failed state with mindless corruption that earned Bangladesh Transparency International’s dubious title of the most corrupt country in the world and anarchy in the streets. The people thus welcomed emergency quietly. But the military, taking advantage of abrogation of the constitution, indulged in excesses while pursuing the drive against corruption under which the two former Prime Ministers, Sheikh Hasina and Begum Khaleda Zia, both women, were incarcerated with a large number of politicians, businessmen and bureaucrats. Although the military backed government had just the constitutional responsibility to create a level playing ground for free and fair elections, it indulged in extra-constitutional roles such as attempting to break the two main stream political parties to create a "king’s party" to which to hand-over power that failed eventually. Their excesses led to spiraling of prices of essential commodities that affected the people very harshly, a predicament further aggravated by an unfavorable international market from where the government had to import essential commodities such as rice, edible oil, etc. The military-backed government did one commendable thing for returning democracy to Bangladesh. They carried out efficiently the task of registration of 80 million voters and issued them photo identity cards. International pressure and people’s impatience with the military-backed government led to the general elections in Bangladesh. The BNP that bore the brunt of pressure of the authorities in their anti-corruption drive was in disarray. In the BNP, those who tried to curtail the powers of the party chief while she was in jail were denied nominations for the parliamentary elections. The AL, in which also senior party leaders tried to curtail their party chief’s powers, took these so-called reformists on board and went to elections united. In addition, the AL that had 14 parties as allies from the 2001 elections, with all these parties in name only, also formed an alliance with the Jatiya Party of former President Ershad that had won 7.6% of total votes cast in 2001. As a result, the AL triumphed in a manner that was unbelievable, winning 233 seats alone and 262 seats with its allies. The BNP that had won 197 seats in 2001 was routed with only 32 seats. In fact, the BNP closely beat the Jatiya party that won 30 seats. The BNP’s allies, the Islamist parties of which Jamaat e Islami was one, failed even more disastrously. In fact, BNP alliance with Jamat, whose members committed war crimes in 1971, and its indulgence in extreme corruption when in power contributed to its election trouncing. developments were also surprising and interesting. In announcing the cabinet, Prime Minister Sheikh Hasina left out almost all her senior colleagues who were in her cabinet when the AL was in power in 1996-2001 naming women in key ministries of Home and Foreign Affairs. In another departure, Sheikh Hasina appointed a number of Advisers with Ministerial rank and amended the Rules of Business so that she can appoint more Advisers who can also sit in cabinet meetings, making them de facto cabinet ministers. For the first time the opposition attended the opening session of parliament that augurs well for transition although immediately afterwards they abstained on seating arrangement. The AL government has its hands full with the election promises it made. There is a "Vision 2021" to transform Bangladesh into a middle income nation. The party is committed against corruption, a popular task undertaken by the military-backed government. It has also pledged to try those who committed war crimes during Bangladesh’s war of liberation in 1971. The economic agenda is an achievable one, for Bangladesh has both the human and natural resources needed for such an agenda. Unfortunately, Bangladesh has faltered in the past in sustainable economic development to become a middle income country because of failure of politics that has seen the army in power frequently as in January, 2007, when the military officials introduced an emergency rule and installed a civilian government of their choice while holding power behind its back after the BNP and the AL had made governance impossible. Bangladesh is the envy of all South Asian countries with no ethnic, regional or religious divide but has squandered her natural advantage over rivalry between the two main parties that was the worst at the leadership level with Shaikh Hasina and Khaleda Zia treating each other as the nemesis of the other. Parliament was made non-functional and politics was dominated by conflict and violence. Thus the new government’s economic agenda will depend mainly on how well politics is managed for which cooperation between the government and the opposition will be crucial. The new government has made its intentions clear on corruption by naming ministers with clean records. This notwithstanding, people who hold public offices in Bangladesh are paid very little while exercising enormous power thus exposing them to the lures of corruption. The corruption agenda will therefore be a hard one to implement. On trial of war criminals, the government is making preparations for setting up a Commission. The demand for the trials is one deeply entrenched in the psyche of the people, but it will extend the government’s ability to the utmost to hold it in a credible manner, because these crimes were committed nearly 4 decades ago. The war criminals are all from Bangladesh’s Jamat-e-Islami party. The government therefore will have to be careful so that just war criminals are tried and not the Jamat. Islam in Bangladesh is based upon liberal traditions being influenced by Sufism and secularism and has fundamental roots in society. Even then, the religious fundamentalists whose number is not very large could whip up trouble by using the slogan that Islam is in peril that could have grassroots support unless the government is careful and sensitive. In foreign policy, this Government is expected to seek closer cooperation with India which is in the country's geopolitical interest.The Indian foreign minister paid a visit to Dhaka this February as an Envoy of his Prime Minister. Two agreements were signed during the visit. The first was the Agreement on Investment Promotion and Protection, and the other was the Bilateral Trade Agreement.Tough issues such as sharing of waters of common rivers, trade and maritime boundary from Bangladesh’s side, cross border security, and land transit from the Indian side were the main focus of discussion between the two countries.The two countries have these issues unresolved mainly on lack of trust and political will, with Bangladesh accusing India of violating international law particularly on water sharing. Only political will on both sides can help achieve sustainable friendly relations. Bangladesh has over 4 million people living in the Middle East whose foreign exchange earnings are crucial for the country’s economic development. This factor, added to Bangladesh’s Islamic base and heritage, will make the need for seeking closer ties with Islamic countries a major focus of the new government’s foreign policy. The new government was quick to condemn the recent carnage in Gaza and will continue to back the Palestinian rights. The December elections have set Bangladesh on course for transition to democracy with great scope to economically transform into a middle income nation. However, political accommodation between the AL and the BNP will hold the key to this transition and transformation. There is now both hope and apprehension in Bangladesh. *Ambassador M. Serajul Islam is Bangladesh's former ambassador to Egypt and Japan. He is Co-Director of the Center For Foreign Affairs Studies (CFAS), based in Bangladesh. Picture: Bangladeshis voted on Monday, Dec. 29, in an election that returns the country to democracy after two years of emergency rule. Photo: Reuters. Art's Universality. Group show of 32 artists from 14 nations and five religions. Organization: City of Genoa in collaboration with the Jerrahi-Halveti Sufi Order in Italy. Picture: Rumi - etching by Professor Gabriele Mandel. Allahabad: Two academicians from the city have won a rare honour in the Indian History Congress (IHC). The executive committee of the IHC has selected two eminent academicians from the Allahabad University to preside over its sessions in 70th IHC scheduled for December this year. Remarkably, this is the first occasion that two persons from the same institution would preside over the different sections of the IHC. The honour has been bestowed upon AU vice-chancellor Prof Rajen Harshe and Prof NR Farooqui, former head, department of mediaeval and modern history and present dean, arts faculty. While Prof Harshe would preside over the session on contemporary history, Prof Farooqui would preside over that of mediaeval history. IHC is a body of eminent historians of the country. It was established in 1935 by Prof Sir Shafaat Ahmad Khan, who was head of the department of mediaeval and modern history, AU, from 1921 to 1944. Prof Harshe belongs to the field of political science and is considered an expert in India's foreign policy. His work in the field of contemporary political developments has fetched him this honour. Besides writing in numerous journals, Prof Harshe's works include 20th Century Imperialism, Engaging with the world, Critical reflection on India's foreign policy and Interpreting globalisation. Prof Farooqui, on the other hand, did his PhD from the University of Wisconsin-Madison, USA and was a Fulbright fellow in 1979-80 and again in 2004-05. He has been senior Liverhulme fellow of the Oxford University. Besides writing in a number of eminent journals, his works include Mediaeval India: Essays on sufism, diplomacy and history and Mughal-Ottoman relations. [Picture: Allahabad, Fort of Akbar, built by Mughal Emperor Akbar (d. 1605 AD) . Photo from http://en.wikipedia.org/wiki/Allahabad]. Sufi clerics in Somalia have declared their support for the new unity government led by a moderate Islamist. The declaration is raising the possibility of a wider sectarian war between adherents of the Sufi order and the powerful al-Shabab group in Somalia. Sufi clerics, meeting this week in the Somali capital Mogadishu, say they fully support the newly-elected president of Somalia, moderate Islamist Sheik Sharif Sheik Ahmed, and the efforts he is making to bring peace to the long-suffering country. The clerics spoke Wednesday through a group of adherents of the Sufi order, who recently took up arms against al-Shabab in Somalia. The spokesman for Ahlu-Sunna Wal-Jama'a, Sheik Abduqadir Mohamed Soomow, says the international community should be thanked for sponsoring last year's peace talks in Djibouti. The talks paved the way for the Ethiopian troop withdrawal from Somalia in January and allowed Sheik Sharif's Islamist-led opposition group to join the government. The cleric says Sufi scholars are calling on all Somalis to support the national unity government, which they hope will rule according to Islamic law and gain the support of the international community. Sufism, a mystic form of Islam, has centuries old roots in Somalia but is considered heretical by conservative factions of Islam, especially Salafism and Wahhabism. Since the fall of Somalia's last functioning government in 1991, Salafism and Wahhabism, taught in many Saudi-run mosques and religious schools in Mogadishu and elsewhere, have gained a following among many young Somalis. These Somalis make up the bulk of the al-Shabab, a militant group ideologically aligned with al-Qaida and vehemently opposed to Sheik Sharif's new western-backed government. Al-Shabab once functioned as the military wing of the Islamic Courts Union, an Islamist movement led by Sheik Sharif before he and other leaders were ousted from power by Ethiopia in late 2006. Al-Shabab grew powerful as an anti-Ethiopian insurgent group and took control of many parts of central and southern Somalia. 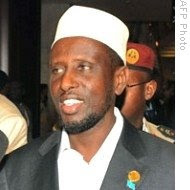 In recent weeks, Sheik Sharif has reached out to the group, urging the leaders to reject extremism and to participate in rebuilding the country. Somalia observer for the International Crisis Group, Rashid Abdi, says although al-Shabab gained many recruits as an anti-Ethiopian insurgent group, many Somalis are now rejecting its militant brand of Islam in favor of Sheik Sharif's call for reconciliation. "It is undeniable that there is a great deal of opposition building against al-Shabab, especially from the traditional Muslim groups in Somalia," said Abdi. "There is a mobilization of various groupings of orthodox Sunni Muslims all over Somalia to form a broad front against al-Shabab." Recently, Ahlu-Sunna Wal-Jama'a scored military victories over al-Shabab in the central Somali Galgadud region, prompting fears that a wider conflict could erupt between the two groups. Abdi says if Sheik Sharif fails to bring al-Shabab to the negotiating table, a war may have to be fought to determine which version of Islam Somalis will embrace. "If these attempts at reconciliation collapse, then the prospect of a sectarian war happening in Somalia is real and that is definitely something to worry about," he said. Sheik Sharif has never spoken out against the Salafist-Wahhabist branches of Islam. But he is believed to be sympathetic to Ahlu-Sunna Wal-Jama'a and its cause. Picture: President of Somalia Sheikh Sharif Sheikh Ahmed, arrives at the UN compound in in Addis Ababa, Ethiopia, 01 Feb 2009. Photo: VOA/AFP. «Le soufisme est une culture extrêmement présente et riche au Maroc. De part sa diversité suscitant beaucoup d'émotion, elle nous a toujours accompagné dans nos traditions et coutumes, permettant une vraie perception de l'Islam», affirme Faouzi Skali, président du Festival. 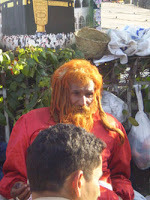 "Sufism is a culture extremely present and rich in Morocco. Due to its diversity generating great emotion, it has always accompanied us in our traditions and customs, enabling a true perception of Islam", said Faouzi Skali, President of the Festival. "How to link spirituality with business, environmental, social action?" "How spirituality and Sufism can become actors of human development?" The endurance it takes to run for 30 minutes is one thing, but it is entirely another to be able to spin continuously for 30 minutes — and is definitely something that deserves applause. The Whirling Dervishes of Rumi performing at the Cox auditorium on Thursday night, definitely made for an interesting, cultural experience. As most UT students have little experience with Rumi, let alone his Whirling Dervishes, it came as a pleasant surprise to many to find the night not only filled with men spinning around in white robes seemingly endlessly, but also other Sufi music and a short educational movie. The Knoxville Turkish Cultural Center and the Turkish Student Association of UT had their audience in mind when they thought to add these elements, as many did not know what was in store for them. Ruth Dike, freshman in anthropology, similarly did not really have much background with any dervishes. The evening began with speeches from different organizers of the event — one of which was in Turkish. Evidently no one had planned for a translator, so the speech turned into something silly when an on-the-fly translation was attempted. The comic value of this presentation, however, nicely contrasted with the next performance, which was a presentation of traditional Sufi music. The music began extremely hauntingly — one instrument at a time was introduced to a sad, melancholy tune. After a time, particularly nasal-sounding voices were added. The music was beautiful in an intriguing, and radically different way from what most (Western) students are used to. After a brief intermission, there was a movie detailing the life and work of Rumi, along with a brief description of what the twirling of the Dervishes means. This short movie added very helpful background for the Whirling Dervishes show. At the conclusion of the movie, the Dervishes finally made their appearance. Beginning with the ritualistic bows towards different areas on the stage, the entire performance appeared to be steeped in mysticism. The spinning really does seem to transcend normal dancing, keeping in mind all of the previous information provided about Sufi music and Rumi. Of course, it was also quite entertaining to watch for pure pleasure, with their flowing white skirts, as David Safdie, senior in graphic design, explained. The entire night, beginning with the first encounter with Sufi music, and ending when the last of the Dervishes put his black robe back on, giving one the feeling of watching an ancient scene that could have taken place hundreds of years ago. The music and dancing did go on for an uncountable length of time, which has both positive and negative aspects. The repetitive nature of the music and dancing did bring home the spirituality of the show, but at the same time, also verged on the monotonous. However, the rituals presented come from a culture and history both older and slower. Overall, the night was one worth remembering (and probably deserving of bucket lists) for its “broadening horizons” effect. [Visit the Knoxville Turkish Cultural Center http://knoxvilleturkish.org/dervish.htm]. On the occasion of the 11th Century Sufi saint’s 965th urs a large number of ‘malangs’ and ‘malangnis’ (mendicants) have erected tents around the tomb of Hazrat Ali Hajvery, otherwise known as Data Gunj Bakhsh, and claim they have established multiple circles of a sound security, as they are representative of a metaphysical force. A large number of malangs, along with their chailas (assistants), have come to the shrine to celebrate the urs in their own style, wearing rings, beads, multi-coloured clothes and anklets. They said it was not the police that was controlling the security, as they themselves were under a security threat, but malangs monitoring the matters through their ‘spiritual cameras’. They said no untoward incident would happen at the urs. The urs ceremonies are attracting tens of thousands of devotees from across the country and abroad. People are thronging the shrine in groups to pay their respects and to say their prayers. Since Saturday, thousands of groups have laid chaddars at the tomb and organised tablighi ijtamas, mehfil-e-naat, seminars on sufism, and speeches. The malangs, performing dhamaal and holding their mtair (sacred stick) could be seen giving instructions to their chailas to prepare bhang and charas, ‘treating’ the visitors. The special ‘thing’ in their tents was the ‘muchh’ (bonfire), where a large crowd was seen sharing their problems with the malangs. Saeen Nazir Hussain, a malang from Hyderabad, said malangs belonging to different sects like Qadria, Qalandria, Chishtia, Sabria, Nizamia, Noshahia, Suhrwardia, Mehbobia and Haideria were present at the shrine, all monitoring security. He said the police could not even protect themselves, as suicide bombers had been targeting them, and malangs were actually taking care of the situation. Baba Hanif Chishti of Faisalabad said, “Spiritual cameras are fit and malangs can see everything”. He said there was no threat of security, and no unpleasant incident would happen. Saleema, a chaili from Shahkot, said she attended the urs every year to get blessings. She said she had done her Masters in Urdu, but considered the spiritual track more important. A female devotee from Multan said she had specially come to attend Data Sahib’s urs, adding that she had shared her problems with different malangs and was satisfied. Aslam Khan, a policeman, said the police were least concerned about the things happening in such tents. He said it was difficult to judge them, but most malangs present there were peaceful. He said criminals like pickpockets also sought protection at the malangs’ tents. About the Chishty Foundation: Chishty Foundation is based on the blessed vision, principle and message of "Love towards all, Malice towards none" which is the blessed message of Hz.Khawaja Moinuddin Hasan Chishty (r.a) popularly known as Khawaja Gharib Nawaz (r.a). It’s a universal message for the whole of humanity that we may love and respect the best of creations i.e. Human beings, among all the creations of the One Almighty Creator Allah (swt). Our aim in establishing the Chishty Foundation is to realizes a blessed vision and to create a platform for people from around the world who believe in blessed message i.e. to love and serve the Humanity ( Khidmat e Khalq ) and to spread the message with all its essence among the people of our beautiful planet Earth. In today’s troubled times we believes that the message the great Sufi’s n Saints is the not just a way but it is the ONLY way for the solutions of the World problems and a perfect roadmap towards the Path of Love, Peace n Brotherhood among the whole Humanity. As part of the larger picture in near future through the blessed platform of Chishty Foundation, we intend to promote the blessed Sufi teachings of Khawaja Gharib Nawaz, Sufi Art of Calligraphy, Sufi Poetry culture, Sufi music and concepts of Spirituality and Music and a strong connection between a Higher state of awearness of the Divine presence through Sama and Qawalli – The Chishty Sufi’s food for the Soul. The Sufi Art Festival 2009 is our first step towards realizing the blessed vision and also marks the launch of Chishty foundation. Ma Salama Ishq Bashad wa Baraka Bashad ! Alhamdulilah , this is our humble beginning ………….May Allah (swt) accept this humble efforts and services of Chishty Khadims. ‘Fusion’ an exhibition of paintings by Naureen Naqvi and Michael Anthonisz is now on at the Barefoot Gallery and will continue till February 22. Naureen Naqvi is enjoying the luxury of being a full-time artist. She has only been in Colombo a week but her mind is brimming with ideas and her sketchpad is filling up fast. Not surprisingly for this accomplished artist, her calendar is already full for the months ahead. Here for a joint exhibition with Sri Lankan artist Michael Anthonisz, she is also working on her next show to be held in the US and after that one in Islamabad. The vivacious Pakistani artist is very much at home in Colombo and feels an affinity with the country and its people. Having been here three times before, first representing Pakistan at an international artists’ camp organised by the George Keyt Foundation in 2000 and then subsequently when she was working for UNICEF, she has many friends here and it was through one of them that she met Mike Anthonisz. They discovered common ground in their love of old buildings and the religious undertones that colour their work and so blossomed the idea for a joint exhibition. “We discussed the idea of having a joint exhibition three years ago, but it never really materialized until three months ago when Mike asked if we could go ahead,” Naureen says. The title ‘Fusion’ would be an indication of not just the meeting of two painters and their work but also of how much the two countries have in common. Her paintings are spiritual she feels, she herself now increasingly drawn to Sufism - the exploration of which will form the basis of her next exhibition. Deeply influenced by her heritage she explains that Muslim art is also related to calligraphy- the writing, the script being portrayed in an artistic way through the calligraphy and she has elements of this in her paintings. Figures are a part, but not significant in her paintings, she says, adding that while she may paint the dancers, she looks at why they dance. How easy is it to pursue a career as an artist in Pakistan? “It’s a struggle,” she concedes, though in her own path she was fortunate that she was given the freedom to study art at University and even do her Masters in the subject by a supportive family. She went on to teach art at University and also worked in Holland for a year before returning to Lahore to take up a high-level post with the Government of Punjab, as Deputy Secretary for Women’s Development and later with UNICEF, her concern for women and children running parallel with her art. These have been causes she feels strongly about - the discrimination the majority of women suffer and the devastating effects of poverty on those who have no voice- women and children. She relates how in the course of building awareness against the hidden spectre of domestic violence, they would even take a Muslim scholar with them when they went to talk to men’s groups so that any arguments about religion being the root of their discriminating attitude to women could be instantly rebutted. Many are the awards she has received not just for her artistic prowess but also for her work in the field of women’s empowerment, but for Naureen, who has just given up her job at UNICEF, her art is a journey of self-exploration, and one that is deeply woven into the fabric of her life. “Each day I open a new window that takes me to myself,” is how she sees it. In the Green Room at the Rialto Center for the Arts in downtown Atlanta, the Whirling Dervishes of Rumi kneeled and said their evening prayers before taking the stage. In the printed program for the event, the audience was asked not to applaud. This was a religious ceremony and it would be considered disrespectful to clap, the program said. The Dervishes, from Konya, Turkey, are followers of the Sufi tradition of Islam. Twenty-six members of the group were in Atlanta Feb. 11, sponsored by the Turkish Ministry of Culture and Tourism and the Atlanta-based Istanbul Center. The Dervishes were founded by followers of Rumi, a Sufi poet and theologian, after his death in 1273. The Dervish performances are a combination of music, singing and the spinning dance known as whirling. The performance, which has four phases, begins with one of the musicians reciting lyrics, written by Rumi, about the Prophet Muhammad. The Dervishes, wearing black robes, enter and circle the stage in a greeting ceremony. They remove the black robes and are wearing white cloth, symbolizing the beginning of the Sema ceremony. “At the second stage, the Sufi begins to think about the greatness of God, and his reflections on the earth especially the creation of the universe,” said Mr. Ozcakil. The fourth stage represents the time that the Dervishes reflect back on their own lives as servants of God. The ceremony ends with a recitation from the Quran and a prayer. The Dervishes hope their performances will increase understanding of Islam worldwide. “It is very helpful for the other cultures and other religious people to have a better understanding of Islam,” said Mr. Ozcakil. “When we look at Islam what we see is that the religion is a religion of tolerance and acceptance. [Visit the Istanbul Center in Atlanta, GA http://www.istanbulcenter.org/default.aspx]. With world-renowned scholars on Ibn ’Arabi, including William Chittick, James Morris, Mohamad Haj Yousef, Stephen Hirtenstein, Sachiko Murata and Pablo Beneito. With musical performances and poetry readings. Ibn ’Arabi, one of the world’s great spiritual figures, represents, along with Rumi, the pinnacle of Sufism. His writings interweave faith and compassion and are deeply relevant today as a counter to the religious intolerance and the conflicts that stir up our world. This conference will examine the heart of Ibn ’Arabi’s teachings about what it means to be truly human, and in the process seek to deepen understanding of Islam here in the West in the light of one of its most profound, original and universally relevant thinkers. For groups interested in attending, whether from a university or other organizations, please call 212-219-2527 ext 140. Chapel Hill: American universities have benefited for years from the largess of Middle Eastern Arabs who have contributed money for the establishment of mosques and centers for Islamic thought on campuses. But that money, typically from Saudi Arabia, came draped in the values of a deeply conservative and patriarchal strand of Islam known sometimes as Wahhabism. On Thursday, UNC-Chapel Hill accepted a different kind of financial offer for an endowed chair in Islamic studies. The money will be raised by the Turkish Women's Cultural Association, an Istanbul-based nonprofit that promotes the mystical strand of Islam known as Sufism and is devoted to social service and education. The association will work to raise nearly $700,000 for the Kenan Rifai Distinguished Professorship of Islamic Studies, named after a Turkish Sufi master who died in 1950. The university will then apply to the state for a matching grant through the N.C. Distinguished Professors Endowment Trust Fund. The arrangement, said UNC Provost Bernadette Gray-Little, represents a "striking demonstration of shared ideals among people of widely different backgrounds." Representatives from the women's cultural association -- who, though Muslim, do not veil -- attended a public announcement Thursday. For leader Cemalnur Sargut, it was her 10th visit to UNC. She first came for a festival eight years ago, and developed good relations with UNC's religious studies department and with Islamic Studies professor Carl Ernst. "They brought this proposal to us last fall, and we presented it to the dean," said Ernst. He hopes the new chair will become a reality within a year or two. 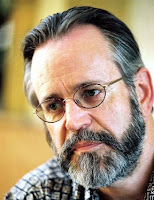 [Picture: Professor Carl Ernst, from his website http://www.unc.edu/~cernst/]. Glowing tributes have been showered on eminent Islamic scholar, Sheikh Mukadam Muhammadul Awwal who passed on recently, aged 82. At a Fidau held for the renowned cleric and author at the Tafawa Balewa Square, Lagos on Sunday, notable Islamic faithful noted that the late Sheikh Awwal lived a worthy life in the service of Allah. Speaking on the occasion, Alhaji Ibrahim Akolade and other personalities noted that the late cleric who was also founder of Khoudamul-Islam Institute of Arabic and Islamic Studies left an indelible mark on all persons who were fortunate to cross his path. The speakers expressed gratitude to Allah for the life of the departed cleric, while praying the Almighty to forgive his shortcomings and bless his soul. Islamic faithful were urged to emulate the life and conduct of the late Sheikh Muhammul-Awwal. Notable personalities who witnessed the Fidau prayers included the Lagos State Governor, Babatunde Raji Fashola , his predecessor, Asiwaju Bola Ahmed Tinubu, Ambassador of Morocco, top Islamic figures within Nigeria and from abroad as well as traditional rulers. Born on April 13, 1926 in Omupo, Ifelodun Local Government Area of Kwara State, Sheikh Muhammadul Awwal father’s was Abdullah Ayinla and he was of the pillars of early Islamic propagation in Omupo town during his time. The sheikh’s mother was a princess in the town as she hailed from Mokaiye Ruling House of Omupo. Inspite of this seeming aristocratic background, Sheikh-Awwal was humble and respectable in disposition to all and sundry. Sheikh Islam’s education was deeply rooted in Islam and Islamic culture. He started Qur’anic school in 1933 under the watchful eyes’ of Alfa Salaudeen Aniyalana of Nana’s compound, Omupo, Kwara State. He was with the late Alhaji Muhammadul Ameen Babaita of Ilorin, to further his knowledge in Arabic and Islamic theology and literature during which period Sheik Awwal cut himself out as a consuming preacher and lecturer in Arabic language. He also had a brief stint of study under the famous Islamic Scholar Sheikh Umoru Agbaji, Ilorin. As a person with passion for thoroughness and erudition, in 1949, the respected cleric went in search of Sheikh-Umar Al-Falike from Kano, who broadened his knowledge in Islamic jurisprudence and Sufism. He got married to his first wife in 1951 and by 1952 as one destined to be one of the great pillar of Islamic propagation and sustenance of its value, he met with Sheikhul-Islam, Alhaji Ibrahim Niass (R.T.A.) who conferred on him the post of Mukadam. Sheikh Mukadam Muhammadul Awwal performed his first hajj obligation to Makkah in 1958. In 1945, with a few other colleagues who shared same zeal and sentiment for Islam, he laid the foundation and established an Islamic Organisation known as Khoudamul Islam Society of Nigeria, which today by the special grace of Allah, has had its Arabic and Islamic Institute affiliated to Lagos State University (LASU), to offer Diploma courses in Arabic and Islamic Studies. He established the first Arabic School in Omupo in 1957, which had successfully transformed into a big Institute as well with Nursery and Primary School in operation – (Sheikh-Muhammadul ’Awwal International Institute of Arabic and Islamic Studies, Omupo, Kwara State). 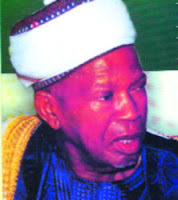 Being the founder and life President of Ithad Ansarul Faelat Tijaniyat of Nigeria, he caused the society to establish yet another educational institute at Sango Otta, Ogun State, where Muslim children were afforded the opportunity of nursery and primary educational experience both in Arabic and Western education. He devoted his life to the propagation of Islam. He was equally a prolific writer of Islamic literature and jurisprudence. Among his numerous literary works are:- Teniwirul-Absori fi Toriki Ilali Haq; Al-Mofaim Tajanniyat; Taamulatu Quraniya; Sufunu Najat; Moridu Rido; A1-Harakatu Tijaniyyahfi Nigeria; As-Babu Wahadatil’U m atil Islamiyat; AI-Istigomat fil Islam; Fiqh-il I rith; Fiqh-zakaat; Alamiyatul Awwaliyah; Shasheu-Bariham Kaolahi; AI-Bayanu Shaafi Fifadohili Suratul Iklas; Shifahul amrodi fil Basmallah; Al Kanzu al-kabir fil fadohili fatihatil Kitab and Hadji Irorun – Book on Holy Pilgrimage. All these literary works can be found in Nigeria and nearly all notable Islamic countries, including Morocco, Senegal and Egypt. The theme of the evening was the spiritual journey of a woman from self-absorbed narcissism to a complete surrender to the Almighty. As Manjari Chaturvedi, a dancer from the Lucknow gharana, laid bare her devotion through what she calls Sufi Kathak on Thursday, Kamani Auditorium came alive with a spiritual aura and soulful ecstasy. “This is an effort to rediscover Kathak from its classical form. I have introduced the mystique of Sufism in Kathak to create a dance form with its own tenets,” said Chaturvedi, 35, who has been performing the meditative dance for 12 years. All the dances were set to quwwalis by Rumi, Amir Khusrau and Baba Bulleshah rendered by musicians from Tehran, Lucknow and Delhi. Dressed in white, as she began with her whirling movements on stage — in a Sufi dervish tradition— (remember Khwaja in Jodhaa Akbar), her body seemed to reach towards formlessness. There was no flamboyance and exhibition. As one dance fused into the next due to the unanimity of the theme, Chaturvedi swayed and twirled, losing herself to the music and Spirituality of the song. After a change in outfits from white to red and then to black, the dancer exuded more power. “This loss of individual identity is precisely the point of Sufi Kathak,” said Chaturvedi, who learnt Kathak from Pt Arjun Mishra of Lucknow gharana. Islamabad: Teachings of Shah Abdul Latif Bhittai, the great mystic poet of Indus Valley; for tolerance and reconciliation in the society provided the best policy for ensuring peace and eliminating extremism from the world. These views were expressed in a seminar on ‘Life and Poetry of Shah Abdul Latif’ held here on Thursday. Addressing the seminar, minister for Zakat and Usher Pir Noor ul Haq Qadri said that mystics like Shah Abdul Latif are the symbol of tolerance, brotherhood and lover for the humanity. He asked the intellectual community to propagate the message of Shah Latif Bhitai and other Sufi poets on international forums, as it contained policy of tolerance, thus it was solution of the global terrorism and extremism through which the world is passing these years. He said Shah Abdul Latif struggled against tyranny, violence and hatred and to establish a peaceful society, where faith and rights of all the people could be protected and respected without any ethnic discrimination. “The mysticism does not come in clash with any faith and civilization rather it mixes up with the traditions and conventions, this incorporation of faith and culture helps to ensure peace in the society,” the minister said. Earlier, Dr Ghazanfar Mehdi urged the government to establish a national institute of ‘sufism’ to promote teachings of the mystics throughout the globe and preserve the great literary heritage for generations to come. Khair Muhammad Sethar, Chairman of the Budhal Faqir Adabi Society, said that poetry of Shah Latif is portrait of Indus Valley civilisation and his verses described the bent of mind of the Sindhis — the humble and tolerant people who never indulge into confrontation with anyone for material gains. This is the story of a river – a river that flows across 2,000 miles and more than 5,000 years. It’s also the story of Sanskrit priests, Greek soldiers and Sufi saints. In her award-winning first book, Alice Albinia follows the Indus River upstream and back through time. Her journey from sea to source is also a voyage from the violent birth of Pakistan as experienced by the people of Karachi (close to where the Indus enters the Arabian Sea) to the birth of the river itself, high in the snow-capped mystic mountains of Tibet. During a history as long and meandering as its own waters, the Indus has been many things to many people. Before Partition enforced its own divisive boundaries, the river acted as a natural border, separating Baluchistan from Sindh and the North West Frontier Province from the Punjab. It curbed the ambitions of invading forces from the West. And its eddies are of spiritual significance to Muslims, Sikhs and Buddhists. The river, Albinia writes, “runs through the lives of its people like a charm”, and it is her encounters with these people – some living, some dead legends – that make her odyssey so compelling. We meet “river saints” like the Shah Abdul Latif, a Sufi poet and chronicler of its lively legends, whose tomb in Bhitshah, Pakistan, attracts Hindu as well as Sunni and Shia pilgrims. A less orthodox figure of unity is Sarmad, a 17th-century Persian-Jewish trader and poet, who converted to Islam, fell in love with a teenage Hindu boy, and roamed India naked as a sadhu. Then there are the Sheedi, curly-haired, dark-skinned Muslims who claim descent from Bilal ibn Ribah, the Ethiopian slave who was the Prophet Muhammad’s first muezzin. Albinia roams around each of her stories, gathering such a wealth of material that she often merely glances on details intriguing enough to sustain pages. In Karachi, for instance, a few sentences sum up several months of adventures that include attending weddings, eating halwa and haleem cooked by refugees who arrived in 1947, and dressing up as a man to infiltrate a gay party at an elite, army-run housing scheme. And then she’s off again. There is danger, too, some of it the result of Albinia’s own foolhardiness. She crosses the Pakistan-Afghan border illegally, almost forgets to don her borrowed burqa, and hires a Tibetan town drunk as a guide. She even drinks watered-down sewage, though perhaps that’s preferable to some of the food she samples – the opium-infused warthog testicles, for instance. When a Kafkaesque combination of Indian and Chinese bureaucracy threatens to curtail her odyssey, she takes a looping detour to the nearest legal crossing point in Tibet – 4,000 kilometres away. Throughout, there are ominous notes. For example, the birth village of Guru Nanak, Sikhism’s founder, was once surrounded by forests filled with lions, leopards and tigers. Today, colonial irrigation projects, hunt-obsessed officials and pesticides have left it a dusty plain. The book’s end takes on the timbre of an elegy. At Ali, in Tibet, Albinia finds the riverbed dry, littered with an old blue boot and a bicycle tyre. “Chinese instant-noodle packets are scattered about like flowers”. Thanks largely to dams, the Indus, for so long a vibrant thread of optimism – an emblem of unity in a region too full of strife – is dwindling. [The book's cover is from http://tinyurl.com/czk6tn]. Islamabad: Renowned religious and spiritual personality and custodian of Golra Sharif shrine, Allama Syed Pir Naseer-ud-Din Naseer Gillani, breathed his last here Friday after cardiac arrest. He was 65. Naseer was preparing for Friday prayer when he felt severe pain in his chest. He was shifted to hospital and was diagnosed as cardiac arrest but he could not recover and died. He was a scholar, renowned poet and author of almost 36 books on Islam, Quran and Holy Prophet (PBUH) including Lafz-e-Allah ki Tahqiq, Quran Majid key Aadab-e Tilawat, Mawazna-e Ilm-o-Karamat, Kia Iblees Alim Tha, Pakistan men Zalzala ki Tabah Karian and Musalmano k Arooj-o Zawal k Asbaab. Mysticism was his field of specialization with regard to research in history and religion. The late scholar had thousands of followers across the country as well as the world. Thousands of the devotees and followers of Pir Naseer used to visit Golra shrine for guidance and spirituality, particularly on the annual Urs of Pir Naseer's ancestors. Pir Naseeruddin Shah was the grandson of Pir Mehar Ali Shah (known as Pir of Golra Sharif). He was the son of late Hazrat Pir Syed Ghulam Muinuddin Gilani known as Elder Lalajee. The news of Pir Naseer's death proved to be a shocking for the devotees, who started thronging at the shrine. Loud cries and moans were audible around the Golra Sharif, a town situated in the suburbs of the federal capital. National awards and Priyanandanan go hand in hand. His debut film Neythukaran won Murali a National Award for Best Actor in 2001. His second film, Pulijanmam, won the National Award for Best Film last year. He is currently in the process of making Sufi Paranja Kadha (The story told by Sufi) based on writer K P Ramanunni's novel of the same title. The shooting of the film has just been completed at various locations near Ottappalam in northern Kerala. The story, which is set during the British Raj, is being narrated by a Sufi or a Muslim mystic. Lahore: Postgraduate Block of M A O College will be named “Prof Ali Arshad Mir Block” in the commemoration of influential Punjabi poet and scholar Prof Ali Arshad Mir. The announcement was made at the reference held in memory of Prof. Ali Arshad Mir (Late), Punjabi Sufi Poet and teacher, M A O College, Lahore, at the College Auditorium on Wednesday. The reference was attended by a large number of college students, academic staff, heads of different college departments and office-bearers of different societies as well as Punjabi scholars. Prof Awais Ahmed Bajwa (chairperson Mass Communication Department), Prof Jawaz Jaferi of Urdu Department and Prof Naeem Niazi of English Department, MAO College, Nabila Kiyani of Government College University, Prof Amjad Shakil, Dr Shehryar, Dr Ghazala Tariq, Prof Nazim Hussnain, Dr Farukh, Prof Zubair Ahmed, Prof Mushtaq, Riaz Danishwar, Prof Majid Wazir, Prof Zubair Ahmed, Prof Mushtaq and Prof Zafar Jamal spoke on the occasion and paid homage to the great scholar. The purpose of the reference was to pay a tribute to the services of prominent Sufi poet, teacher and former teacher of M A O College. Principal of M A O College Prof Zafar-ul-Mohsin Pirzada presided over the reference, however, renowned scholars, Punjabi poets and intellectuals addressed and highlighted the services rendered by the late Sufi poet. I follow all the Islamic tenets in the right interpretation and spirit and so, I can say that there is no such thing as yoga being haram (disallowed) in Islam. Rather, I have found that Islamic yoga is a reality. It is possible to employ the skills of yoga to worship Allah better and to be a better Muslim. Issuing fatwa declaring yoga anti-Islamic by some Malaysian and Indonesian ulema is nothing but misunderstanding and misinterpretation of the fact that yoga and namaz are almost identical. Having practiced yoga during my school days, I found that it can easily be integrated with the Islamic life; in fact the two assist one another. Not only is there no conflict, but Islam and yoga together make a mutually beneficial holistic synergy. Both are agreed that, while the body is important as a vehicle on the way to spiritual realization and salvation, the human being's primary identity is not with the body but with the eternal spirit. Maintaining a healthy and fit body is a requirement in Islam, which teaches a Muslim that his or her body is a gift from Allah. Yoga happens to be one of the most potential common grounds between Hindus and Muslims. The purposes of yoga and Tariqat-e-Naqshbandi (Sufi lifestyle) are apparently similar since both aim at achieving mystical union with the ultimate reality namely Brahma or Allah. The Indian Muslims' love affair with yoga is a complex thing, born of many factors. There's the general disenchantment with strict, orthodox Islam of the myopic clerics and the accompanying pull to alternative forms of spirituality. Yoga, according to Ashraf F Nizami's book 'Namaz, the Yoga of Islam' (published by D B Taraporevala, Mumbai 1977) is not a religion. Rather, it is a set of techniques and skills that enhance the practice of any religion. Nizami writes that in namaz, various constituents like sijdah is like half shirshasana while qayam is vajrasana in the same way as ruku is paschimothanasana. Even Father M Dechanel wrote a book on Christian yoga recording that practicing yoga is encouraged because it is a way towards the realization of Christian teachings. According to Badrul Islam, a yoga instructor at a government academy in Dehradun, one of the most obvious correspondences between Islam and yoga is the resemblance of salat (five-time prayer a day) to the physical exercises of yoga asanas. The root meaning of the word salat is 'to bend the lower back', as in yoga; the Persians translated this concept with the word namaz, from a verbal root meaning 'to bow', etymologically related to the Sanskrit word namaste. The 'Book of Sufi Healing' by Hakim G M Chishti clearly states that life, from its beginning till the end, is one continuous set of breathing practices. However, in Tariqat-e-Naqshabandiyah, the Sufi tradition of Islam, breathing practice has been there exactly as in yoga. The Quran, in addition to all else it may be, is a set of breathing practices. The enigmatic and most revered Qari (one who melodiously recites Quran) Abdul Basit of Egypt, whose recitation of the Quran is considered the best till date, practiced breathing exercise exactly similar to pranayam and was able to recite a surah by holding his breath for such a long duration that even the medical experts were amazed. However, no one told the Qari that he did it with yoga. Nowadays, yoga is commercially promoted for health and repel diseases. In fact, less exercise owing to long office hours on computers is one of diseases of modern world. Cars, motorcycles and computers are our main pulse beat of contemporary life. People no longer think about physical and spiritual exercises, which makes a good excuse for Muslims to be offered yoga practice. Besides, many western societies are materialistic and for limitless monetary gains people would fall prey to rat race and superiority whereas their spiritual sides remain void. Forms of yoga such as Patanjali, Tantra, Sankhya and Dhyana, among others, are non-religious as even the atheists can practice them. Yoga today is a way of life for the followers of all religions. The place of yoga in the lives of most Muslims will not be shifted by the fatwas of Indonesian and Malayian ulemas. Those who practice will practice, the so-called super-pious will frown. Even in the Middle East and Iran, yoga is a pet with Muslims. Most Muslims in India are dazed that the all-encompassing credentials of yoga need to be debated. Let's appreciate that at this time, the pro-yoga fatwa by the renowned Darul Uloom Deoband seminary has given it a clean chit and Swami Ramdev has also given the green signal that Muslims can substitute Allah for Ohm, but was it really required? Quite interestingly, the word Ohm, according to Urdu or Arabic alphabet, is formed from three alphabets - Alif, Wao and Meem. If we consider the abbreviations of these, Alif means Allah, Wao or wa means 'and' while Meem means Mohammed. It shows that Ohm is a confluence of Allah and Mohammed. May be some super-pious will also frown upon me on this word play. Firoz Bakht Ahmed is a commentator on social and educational issues. New Delhi: It was a date with history. A date to discover legacy created more than 600 years ago in Rajasthan. Neeru Misra's book, "Splendours of Rajasthan Paintings - Gulistan of Alwar School'' is a rare work of art. The book was released on Wednesday by ICCR president Karan Singh, in a function presided over by Pavan K Varma. Reproducing works of art almost 600 years after their original composition is no mean feat. `Gulistan' was created in Rajasthan's Alwar court and was composed by celebrated 13th century Sufi saint, Sheikh Sa'adi. A mix of Persian and Mughal miniature traditions, the paintings and the manuscript belong to late 18th century. The commissioning of the manuscript started in 1844 and it was finished in 1853 during the time of Raja Banni Singh of Alwar. Misra, who took almost three and half years to complete her research on the book that included frequent visits to Alwar, maintains that the town's history has not been explored or aptly documented till date. A trained art historian and guest faculty at the National Museum Institute's Art of Miniature Painting, Misra included 18 paintings with 12 main stories in her book. "These stories tackle issues of good governance and good ideals of that time. These are written very satirically by Sa'adi,'' she says. Releasing the book, Singh said he was surprised by the discovery of Alwar in this art form. "I didn't know Alwar had a school of painting. The extraordinary colours are so fresh,'' he added. Singh said, Misra's book not only rekindled interest in Indian art, but was also a salute to the fading culture of India. The Alwar school and Sa'adi's work, he said, were well represented in the book. Elaborating the Persian influence on Indian culture, Singh said, "We need to rediscover the impact Persia left on India. Even in Kashmir, the Chinar, zafran, kahva, carpet making -- all came from Persia''. Commenting that India is at a crossroads of sorts, Singh asserted that while it has always been a great originator of culture, the country has also accepted various streams. "The Persian-Sufi stream is one such important stream in the growth of Indian culture,'' he said. Physical Description: 184 p., 17 leaves of plates : col. ill. ; 25 cm. Islamabad: Prime Minister Yusuf Raza Gilani on Friday stressed the need for character-building of country’s various institutions, adding it would bring improvement in the overall good governance. Addressing the book launching ceremony of Almas Amir Koreja’s poetic creation ‘Tujhe dekhne ke baad’ organized by Khwaja Farid World Council, the Prime Minister said character-building of educational sector was particularly required for bringing positive change in the society. The Prime Minister appreciated the author Almas, who is the grand-daughter of Sufi poet Khwaja Farid, and said through her writings, she followed the footprints of the great mystic who worked for the betterment of the society. He said it was the right time to promote the teachings of Khwaja Farid, who was also the first Sufi poet to introduce the concept of public-level politics in the sub-continent. The Prime Minister termed the event a multi-dimensional occasion that carried a melange of literature, Saraiki culture, Sufism and also the author’s verses written in memory of Mohtarma Benazir Bhutto. He said the poetry by Almas, giving a reflection about her inspiration from Benazir Bhutto’s personality depicts her deep fondness for great leaders. Referring to his own book ‘Chahe Yusuf Se Sada’ penned during his imprisonment, the Prime Minister said it enclosed a complete history of Pakistan and could be used as an authentic reference for Ph.D. researchers. Gilani also quoted a few poetic verses in Saraiki, and said the language contains a unique vastness in similarity with the culture of the area. Farzana Raja, Chairperson Benazir Income Support Program appreciated Almas Koreja for carrying forward the traditions of Sufism to the third generation and for paying tribute to Mohtarma Benazir for her sacrifices. She said Benazir Bhutto always encouraged women to explore their talent, adding the government would continue following the same legacy. She said Pakistan Peoples Party always upheld principles in the politics and said the government would complete its five-year tenure by prudently overcoming the challenges. Attorney General for Pakistan Sardar Latif Khosa said the book dedicated to Mohtarma Benazir Bhutto refreshed the memories related to her, adding it truly describes the pain one can feel after the demise of a great leader. He said Benazir Bhutto always wanted to promote democratic norms in the country. He also suggested for establishing more universities in the Saraiki belt, which is known for being rich in talent and culture. Khwaja Amir Koreja, Pir of Mithan Kot and Sajjada Nashin of Kot Mithan Khwaja Moeenuddin also spoke on the occasion.